Still chipping away at my Parkhurst hockey sets. This "pin-holed" 1963 Henri Richard ebay pick-up was $4.20 delivered and I was happy to get it! You and me are probably sifting through the same dollar boxes at the National, Larry. I'm not making the trip to Chicago this year Adam so the dollar boxes are all yours! Hello! New to net 54 and collecting as a whole! Thought I’d share my fav card I’ve picked up this year! 1962 Parkhurst, Gilles Tremblay. Very nice, can't go wrong with vintage Parkhurst hockey. 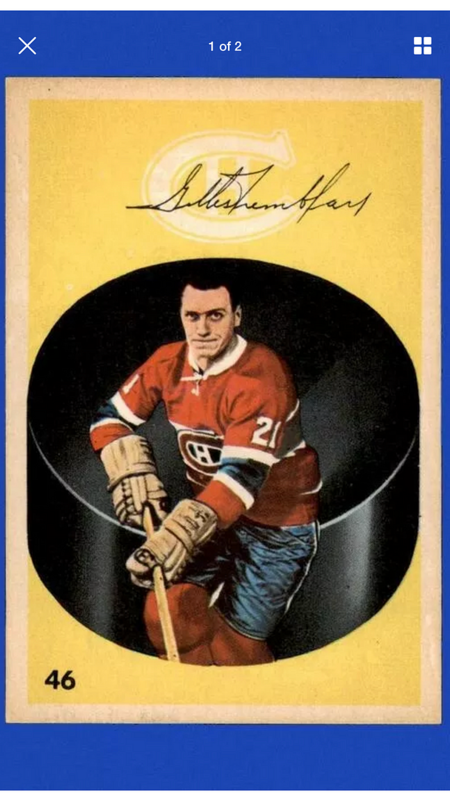 Look, if you are like me, and you are trying to complete your Parkhurst hockey sets, you will have to shop with the great dealers north of the border. Watch the "small" print that describe shipping costs. Watch if your snipes are US or Canadien currency. Don't watch your mailbox because it will take time. Patience grasshopper. So I picked up 20 low grade hits to my pathetic 1952 full set attempt. All of these were auctions style listings, and I missed on at least twenty more. Total cost for the cards in US $44.93 and shipping $7.48 US total $52.41 or $2.62 per card delivered which is quite good I think. About 1/2 the cards suffer from slight back damage. It took 24 days after payment to get the cards to me in Florida but I think it was worth the wait! I like hockey and I like hockey cards. But I don't know much about the players. Recent eBay win 1960 Parkhurst #3 Johnny Bower arrived today now I need only five cards to complete this set. Card cost $4.52 but $4.48 to ship from north of the border. I was going to post that I might have overpaid a bit for this card, not much though (based on the low grade). But Johnny Bower is a Hall of Famer plus in 2017 he was voted one of hockeys greatest 100 players ever plus he lied about his age to join the military and served in WWII plus it's a pretty awesome card.